Today we are going to talk about Push Notifications Services and we’ll share a list of the best 12 services available on the market and tips on how to do them properly. Keep reading! Push Notifications are messages sent by apps that pop up on user’s device, and their function is to deliver information and improve engagement. A Push Notification (also called server push notification) allows to deliver information from the app to the mobile device (or computer) without a request from the user. It also doesn’t need the app to be opened, so it represents a significant source of information because the smartphone will display the text message even if the app is closed and the screen locked. Therefore, the user is definitely going to see it. They are the opposite side of Pull Notifications, in which users request information from a server – Push Notifications originate from a server. In terms of usage, the receiver should accept these alerts, usually during installation, or in settings, where they can turn them off or on later on if they change their mind. Having that in mind, a good practice on Push Notifications would be to make settings flexible and let the users choose which notifications are they interested in. If you offer them just two options (turn notifications OFF / ON), they are more likely to disable them. 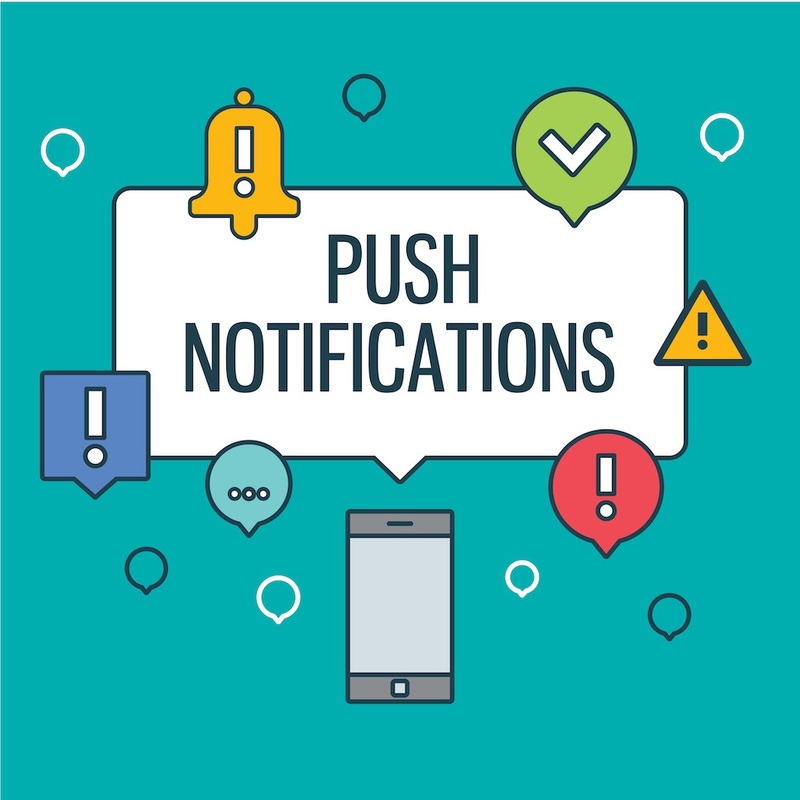 If you are interested in learning more about how to create successful Push Notification messages, you’ll like this post! Push Notification Services came out ten years ago, so there’s a huge variety available on the market. The number of these platforms increases everyday, and it is difficult to find the one that fits our needs best. Although there is no “perfect” tool, we are sharing a list of renowned services that can help you handle Push Notifications. Amazon Simple Notification Service (SNS) has been going on since 2010. It is compatible with Amazon Web Services (AWS) and it allows app owners to send app Push Notifications to several platforms, such as Android, iOS, Windows Phone, etc. It’s also possible to send Push Notifications directly from the cloud. Price: The first million messages are free, beyond that its price is $0,50 per million. BTW, are you planning to sell stuff on Amazon? Check this out! Carnival outstands for its rich messaging feature, allowing to send video, images, links and emojis through a simple and effective interface. It’s possible to send push notifications, in-app notifications and message personalization, as well as to automate them. It also has an analytics feature. Price: From $1,000 per month, but it can scale depending on the kind of company and the number of Monthly Active Users. OneSignal is a multi-platform Push Notifications Service company and it was launched in 2014. It can send both web and mobile Push Notifications and email. More than 500k app developers use it, as it has almost all the features you could ask for (A/B testing, automation, tracking, etc.). Price: It’s free, although it has premium packages upon request. Kumulos is a Mobile App Performance Management platform for mobile app and software development companies. Mobile marketers can sell a Push Notification Service with its dashboard and easily manage campaigns, as well as reporting on the results. Pricing: It has three packages: Startup, Enterprise and Software Development / Mobile App Agency. Founded in 2011, Pushwoosh has a wide range of tools to send mobile and web Push Notifications with rich content, such as images, embedded videos and CTAs, among others. Price: It has 4 packages: Startup (free), Developer ($41,95/month), Marketing ($125,95/month) and Enterprise (custom). Urban Airship was founded in Portland in 2009, and it’s a multifunctional platform that combines Push Notifications, in-app messaging, targeting features and analytics.They work with all kind of business: retail, media, sports, travel, etc., having as clients remarkable companies such as Adidas, Sky or The Wall Street Journal. Leanplum stands out in terms of personalization and automation. Regarding the first feature, the User Interface can be tailored to specific users, therefore changing some aspects depending on users’ behavior. It can also send personalized messages automatically based on behaviour and user characteristics. Price: Pricing information goes upon request. Intercom is a messaging platform and it has a broad variety of communication tools in order to reply messages, engage and interact with customers. It also has a Push Notifications system that allow marketers reach out users outside an app. Price: It has three kinds of packages: articles, inbox and messages. The last one is the one that includes Push Notification Service and its price starts at $49/month, increasing depending on the number of users. SWRVE is one of the leading mobile marketing automation companies. Its main highlight is its WYSIWYG mobile screen editor. It also has personalization features regarding sounds and alerts, as well as banners on locked screens and analytics. It has high profile clients such as Electronic Arts, Sony, HTC and Samsung. Mixpanel offers a retroactive funnel reporting features, real-time data analytics and segmentation in order to make sure that push notifications are optimized. It also includes A/B testing and automation. Price: It has three packages: Free, Startup ($999/year) and Enterprise (price on demand). Catapush differs in the pushing notifications game because of its 2-way service, allowing replies to each sent message. Its real-time communication channel with customer is their competitive advantage over competitors. Price: It has three prices depending on the number of recipients: for 100 (free), 1,000 (20€/month), 10,000 (180€/month) and 20,000 (320€/month). Taplytics is a Push Notification system that also offers A/B testing and analytics. Some of the other features available are automated messaging, geolocation to send Push Notifications to specific locations and real-time analytics. Its campaigns can also be measured with specific goals in terms of retention, awareness or engagement. Price: it has a basic free package and an Enterprise pack available on demand. Have you worked with Push Notifications? Tell us your experience in the comments. Thanks for reaching out! We know the list of push notifications services is waaaaaay longer, and that’s precisely why we had to cut some of them out. Firebase is, indeed, a strong tool for that purpose!